Vehicles and similar assets such as boats, motor cycles, ATVs, etc., represent large investments that homeowners want to protect against harm from outside elements. Which is one good reason to plan a new garage or carport project. But which is right for you and your family? 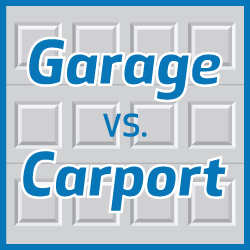 We will outline the pros and cons of a garage vs a carport below. Less expensive – Building a carport is far less expensive than building a garage. Fewer materials are required since there are no walls, doors or windows, and that translates to lower labor costs, too. Quick to build – Carports are relatively simple structures, so they can be built very quickly. An experienced handyman could probably complete the job in just a couple weekends. Easier to get approval – Because carports are not considered enclosed or livable space, it’s usually easy to get the project approved by your city or town. The guidelines are less stringent. For example, you won’t be required to build fire-rated walls or ceilings. Limited protection – Carports offer some protection from the sun and the elements, but not complete protection because they lack four walls. In most cases, at least two sides of the carport are open. Sometimes all four sides are open. Smaller – Most carport designs provide enough room for just one or two cars. There’s usually no room for storage shelves or a workbench. Not ideal for storage – You can’t lock a carport, so it’s not a good idea to use them for storage, even if you do have extra space. Your items can get wet or they could be stolen. Not as attractive – Most people consider a full garage to be more attractive than a carport, although this is a matter of personal preference. Garages tend to be better for resale value, particularly in harsh climates – like Chicago ;). Full protection – Garages offer full protection from the elements. Your cars and personal items will be sheltered from rain, sun, wind, hail – you name it. If you live in a cold climate, you’ll never have to clean snow from your car. Great for storage – Garages are ideal for storage because they are completely enclosed and can be locked. They also tend to be larger than carports, with extra space for shelves or workbenches. More attractive – Most people would agree that garages look nicer than carports. The appearance is more finished and polished. Garages are also much better for resale value than carports. More expensive – Building a garage is much more expensive than building a carport. You’ll pay more for both materials and labor. Take longer to build – Because garages are more complex structures than carports, they take longer to build. Stricter building requirements – Gaining the necessary building approvals from your city or town will be a longer and more involved process when you’re building a garage. And you will be held to stricter building standards because the space is enclosed. At a minimum, you’ll have to install lights and fire-rated walls and ceilings. Via KompareIt. Another helpful resource is our, Carport to Garage Conversion Checklist.